The body of a pregnant Fort Bragg soldier was found in a motel room bathtub after a maintenance supervisor smelled a foul odor coming from a room with a 'Do Not Disturb' sign, according to a search warrant released Thursday. 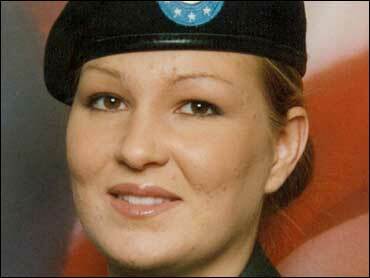 The warrant revealed few other details about the death of Spc. Megan Lynn Touma, 23, who was found in her Fayetteville motel room Saturday. Police have called her death suspicious. The state medical examiner's office examined her body Thursday, but toxicology results are pending and officials did not say when they would release an autopsy report. Touma, a dental specialist, was seven months pregnant and had recently arrived from a base in Germany. She was temporarily assigned to Fort Bragg's 19th Replacement Company before reporting to a dental clinic at Fort Bragg. Maj. Angela Funaro, a Fort Bragg spokeswoman, said Wednesday that the Army is investigating why Touma wasn't reported missing. Army regulations would have required her to reported absent without leave 24 hours after missing a formation on June 16. "We're shocked, first and foremost. It's always sad when you lose a soldier. And on top of that, here's a beautiful young woman who is seven months pregnant. It's sad, and deeply troubling," Funaro said. A barracks room was provided for Touma, Funaro said, but she decided to pay for a motel room instead. CBS News affiliate WCSC-TV reports that other Fort Bragg officials say Touma was allowed to live in a hotel at their expense until barracks space was provided. Touma's former husband, El Sayed Touma, an Egyptian native who served in the U.S. military and now lives in Charleston, S.C., said the Army had told her family she was absent without leave and never went to look for her. "She was left in the room for two days, and the Army said she was AWOL. They didn't even bother to go check on her in the motel where she stayed," he complained. Touma says he is not the father of Megan's baby, but that the couple had stayed friends following their 2007 divorce and Megan wanted to name her baby after him, WCSC reports. Touma has not been contacted by police, but said he is willing to help them in any way he can. Touma's family has declined comment from their home in Kansas, said Deb Skidmore, a spokeswoman at Fort Riley, Kan.
Funaro said Thursday that Touma was never declared AWOL. She said the Army is investigating why procedures to account for personnel weren't followed. "We will determine what the shortfall was, correct it, and adjust as necessary for the future," she said. Megan Touma is the second pregnant service member to die in North Carolina this year. Lance Cpl. Maria Lauterbach was found dead near Camp Lejeune in January. A fellow Marine, Cpl. Cesar Laurean, has been charged in her death and is awaiting extradition from Mexico.